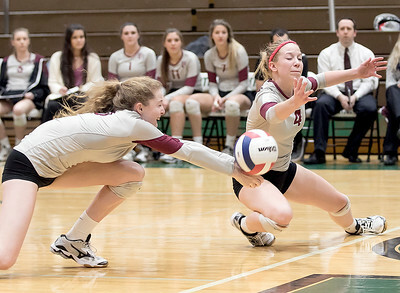 Sarah Nader - snader@shawmedia.com Prairie Ridge's Hannah Baudin (left) and Kelsy Turskey dive for the ball during Tuesday's Class 4A Crystal Lake South girls volleyball regional against Hampshire Oct. 25, 2016. 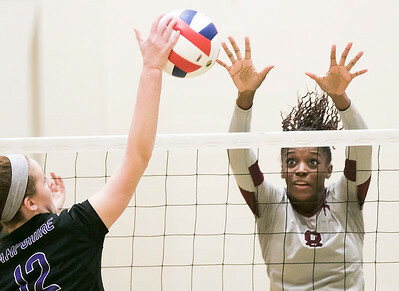 Prairie Ridge won, 24-26, 25-11, 25-5 and will play Crystal Lake South in the championship Thursday. 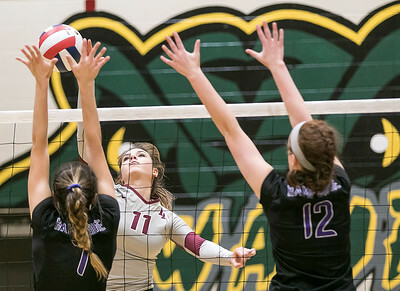 Sarah Nader - snader@shawmedia.com Prairie Ridge's Olivia Annen (center) hits the ball over the net during Tuesday's Class 4A Crystal Lake South girls volleyball regional against Hampshire Oct. 25, 2016. Prairie Ridge won, 24-26, 25-11, 25-5 and will play Crystal Lake South in the championship Thursday. 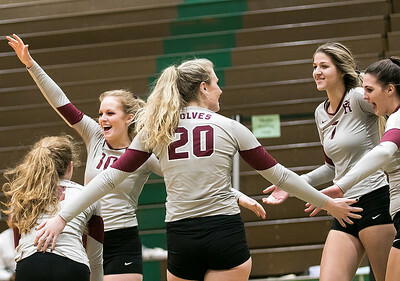 Sarah Nader - snader@shawmedia.com Prairie Ridge's Emily Baudin (left) celebrate a win during Tuesday's Class 4A Crystal Lake South girls volleyball regional against Hampshire Oct. 25, 2016. Prairie Ridge won, 24-26, 25-11, 25-5 and will play Crystal Lake South in the championship Thursday. Sarah Nader - snader@shawmedia.com Prairie Ridge's Emily Baudin returns the ball during Tuesday's Class 4A Crystal Lake South girls volleyball regional against Hampshire Oct. 25, 2016. Prairie Ridge won, 24-26, 25-11, 25-5 and will play Crystal Lake South in the championship Thursday. 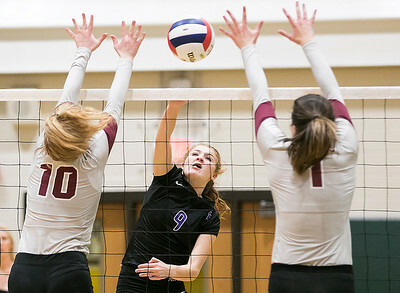 Sarah Nader - snader@shawmedia.com Hampshire's Riley Seagren (center) hits the ball over the net during Tuesday's Class 4A Crystal Lake South girls volleyball regional against Prairie Ridge Oct. 25, 2016. Prairie Ridge won, 24-26, 25-11, 25-5 and will play Crystal Lake South in the championship Thursday. 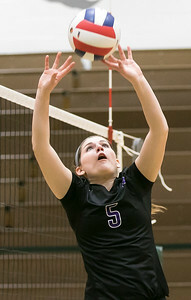 Sarah Nader - snader@shawmedia.com Hampshire's Sophie Holtz sets the ball during Tuesday's Class 4A Crystal Lake South girls volleyball regional against Prairie Ridge Oct. 25, 2016. Prairie Ridge won, 24-26, 25-11, 25-5 and will play Crystal Lake South in the championship Thursday. Sarah Nader - snader@shawmedia.com Prairie Ridge's Genesis Sheridan jumps to block a ball during Tuesday's Class 4A Crystal Lake South girls volleyball regional against Hampshire Oct. 25, 2016. Prairie Ridge won, 24-26, 25-11, 25-5 and will play Crystal Lake South in the championship Thursday. 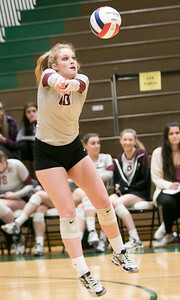 Prairie Ridge's Genesis Sheridan jumps to block a ball during Tuesday's Class 4A Crystal Lake South girls volleyball regional against Hampshire Oct. 25, 2016. Prairie Ridge won, 24-26, 25-11, 25-5 and will play Crystal Lake South in the championship Thursday.